Starting in the winter of 2015, Hinckley Yacht Services will begin installing its new boat monitoring service, Hinckley OnWatch, on boats serviced in the company’s yards. Using existing technologies in boat monitoring Hinckley engineers have developed an expanded system which includes new features, such as mechanical diagnostics and historical data retention, to create one of the most advanced yacht monitoring systems on the market today. 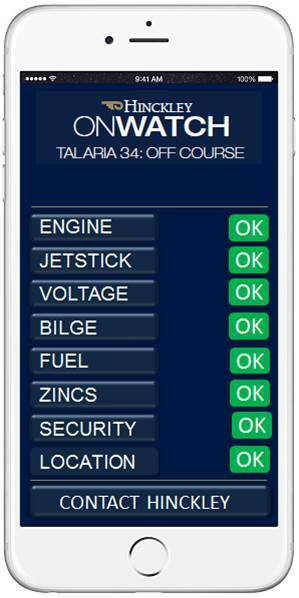 Hinckley OnWatch will use 3G cellular connectivity to send Hinckley Yacht Services status updates to its service network as well and to the yacht owner so that both are alerted in real time in the event an issue occurs. The goal with the OnWatch system and mobile app is to keep boat owners effortlessly connected to their vessels and, as a result of this heightened awareness, reduce down time, increase safety, allow custom-tailored service planning and even reduce insurance rates.